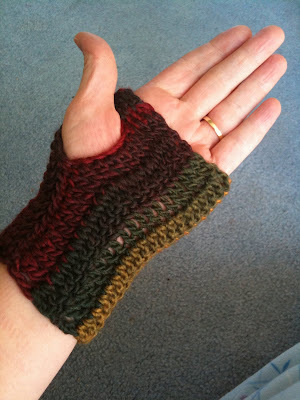 Apparently, Alice wears knitted some wrist warmers in the second Twilight movie and now they are all the rage! I do find them most useful and will definitely be gifting them in the future! I can wear them all the time, typing, crocheting, well, not while doing dishes I guess:) In fact, I'm wearing them right now! My fingers are always the coldest part of my hands so it seems like these would be useless since they are left uncovered BUT I do notice a difference in my overall warmth while wearing them! They are as simple as making a rectangle and leaving an opening for the thumb when you seam the side together! This yarn is Mochi Plus (the bigger version of the Mini Mochi from my previous post) and so far I absolutely love it. I think I used a size I hook, ah, I can't believe I already forgot when I made these yesterday! 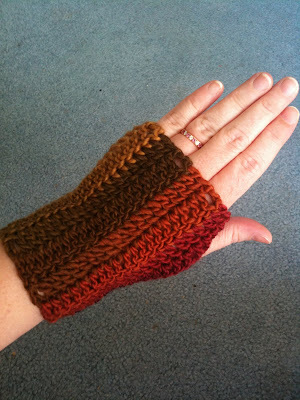 I will probably try a slightly smaller hook next time to make the stitches a bit more compact. And, note to self: leave a longer tail when finishing off each rectangle so it can be used to seam them together!